Be a game-changer with the Barbie remote-control roller-skating doll! Inspired by Barbie Video Game Hero, she's ready to skate into the game with all kinds of amazing moves. Use the star-shaped remote control to direct the action. It's so cute in bright yellow with face details! Use the buttons to send Barbie forward or backward or see her perform a split… followed by 360-degree spins. Press the smile button to play music to accompany her moves or turn the music off. It's so much fun! 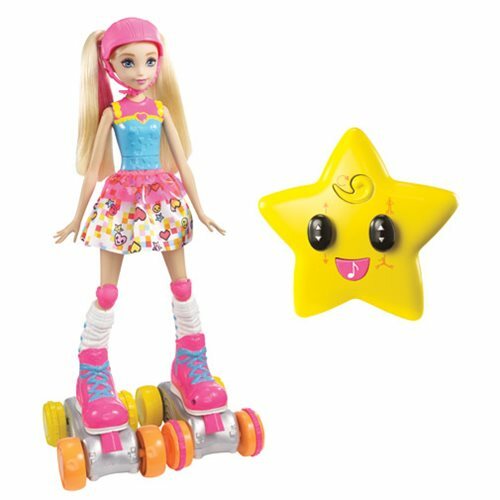 The Barbie Video Game Hero RC Skater Doll is ready to score game points in a colorful anime outfit with molded bodice, print skirt with transparent peplum, and removable helmet for her pink-streaked hair. Her skates are oversized and colorful for extra-big fun and cool gaming style. Young gamers will love recreating favorite scenes or wowing an audience! Barbie comes with a helmet, roller skates, and a star-shaped remote control. Doll cannot stand or roller skate alone. Colors and decorations may vary.